Description: Years ago I was watching a television special about the Amazon Rainforest and the annual floods of the Amazon River. 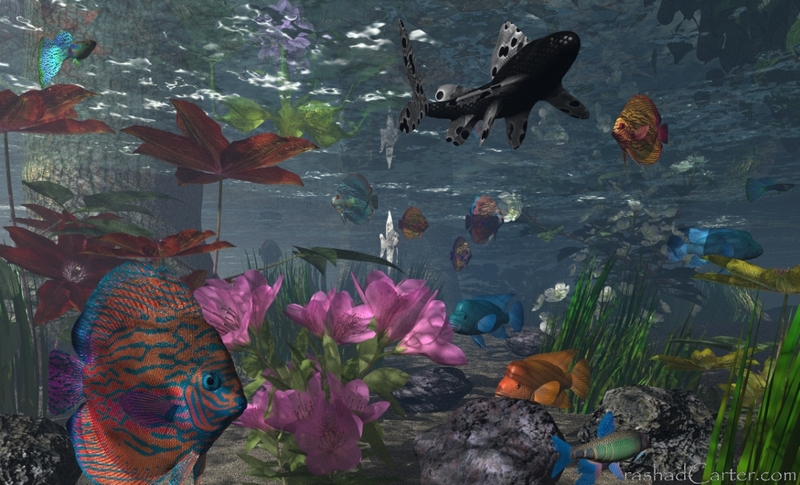 I was struck by the wierdness of fish swimming through fields of flowers in the rainforest and I was impressed by the beauty of the flowers next to beautiful tropical fish. Each year the Amazon River rises around 30ft submerging low lying areas of the Rainforest for a few months during the summer. Fish come onto land to breed and feed on fruit in this exotic landscape during this time. GPS Satelites confirm that the crust of the earth depressed 3inches last year during the floods. The Amazon River holds 11 times more water than the Nile, and is almost as long. 25% of all fresh water globally is held in the Amazon River. Another attempt at a new level of realism in bryce. Extensive texture and material pre-production in PSP7. Models of plants are from 3d cafe along with the fish also I think (I've forgetten where exactly), and some fish modeled in Bryce5 using metaballs. Foliage transparency maps and subsurface scattering techniques were used as exampled in the leaf materials I uploaded to the material exchange section of this site for the plants and fish fins. Rendered in Bryce5.5. No post production of any kind. This is the second image I've uploaded featuring my global illumination work-around. There is no ambient expression anywhere in this scene, just secondary light sources. Thanks for the information about the Amazon, most of which I didn't know before. The most striking thing here is the water surface, which is very difficult to get right. The fish are extraordinary and the flowers beautiful. The ground looks good, too. It isn't your fault that Bryce cannot bend plants. If this is in the Amazon, the river would flow and this should be seen on the plants. If it were a pond, then all would be fine. The bark of the partly submerged tree at left looks very real. The only thing that disturbs me is the shadow of that trunk, right in the centre of the picture. The water seems too clear for me to account for it. Minor quibbles about a very colourful peaceful picture. Beautiful and well thought out. The first and most important thing is that I really feel I'm under water. You succeeded with that part. Again - the technique you applied seems to get those plants as real as possible, even underwater. But Horo pointed something. Your water is too clear. Maybe a little play with the haze/fog will do. Green-nuance muddy water perhaps could be best. Other then that - very good. Your ground and rock materials are well chosen, fishes are great, shadows are there. No qualms. Rashad, it's as good as done, but if you have intensions to rework it with a "new" water-visual-distance, you'll be getting the 5/5 without any hesitation. I concur with each of you 100%, especially about the water clarity. I like that both of you pay attention to details and don't let me get away with approximations. I knew you two would mention the clarity and I forgot to explain my reasoning for it in the description. The water clarity is a deliberate choice. I wanted the textures to be visible. The haze settings should be higher. But haze obscures quality and contrast levels by making everything grayish. I was so proud of the way I tweaked the DAZ Studio tree trunk texture and I wanted it to be visible yet not too close to the camera. I needed the tree trunk to be visibly poking out of the water in order to translate the sense of rainforest and overhead canopy which is responible for the shadows. I probably will post another version of this scene in time. Though I'm happy with this one artistically, it needs dirtier looking water to be more convincing. Horo is correct about the plants bending. I did at least use aquatic grass models that are wavy to mimic the weight of water a little bit but I could not do the same for the flowers. Thanks for the feedback guys. This is a dream piece. I love fish, especially bright ones from the sea. Your work is top notch. How many years have you been at this? It looks so real. Wow. Your a great mentor to follow.